1. Soak the bread in 150ml cold water. Meanwhile, steam the asparagus for 3-5 minutes, until just tender, then plunge into cold water; drain. 2. Blitz the almonds in a blender to a fine powder; whizz in the garlic. Add the oil, vinegar and bread (reserve the soaking water); blend until smooth. Whizz in the soaking water and most of the mint, reserving a few leaves; season. 3. 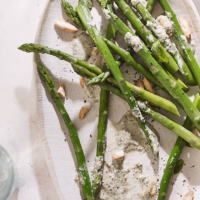 Divide the asparagus between plates, adding a puddle of the sauce to each. Scatter over the reserved mint and extra toasted almonds before serving. This recipe was first published in Fri May 01 12:29:36 BST 2015.